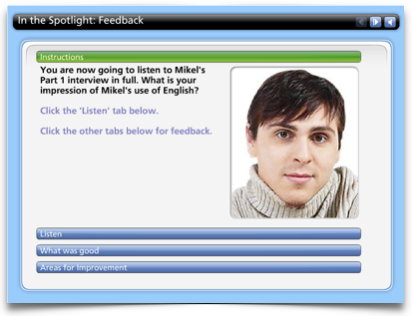 In addition students can test their knowledge of useful topic vocabulary, key areas of spoken grammar and evaluate recordings of advanced level students attempting CAE-style Speaking tests. It has very good tips and illustrative examples. It’s well organised and has anything a student could ask for. It’s excellent! This e-tool really helped me. It was simple and clear enough and I can recommend it to everyone who is going to take CAE. Thanks! Thanks a lot for this program, it made me feel much more confident about my Speaking Exam!